We still had the whole day to us on our lodging boat. The vessel had arranged kayaking for us. 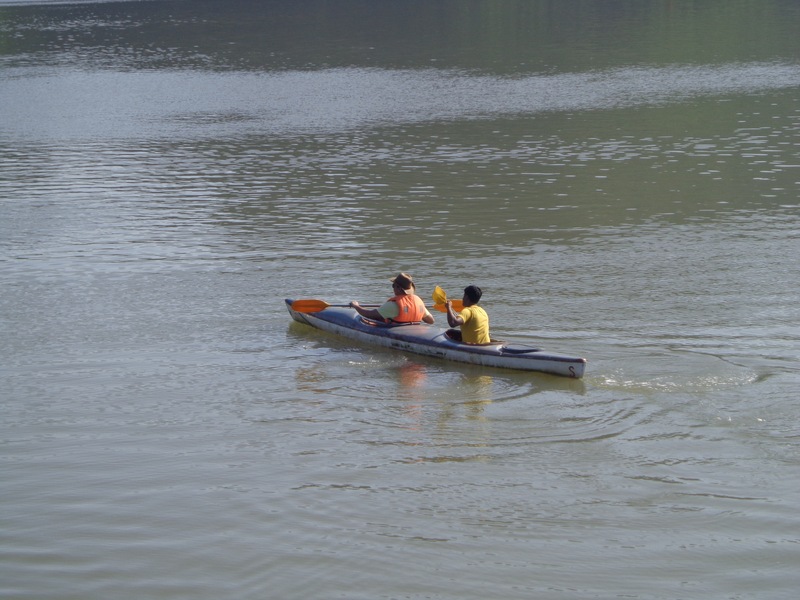 Although Phuong asked two people to get into one kayak, I got a kayak to paddle on my own. I felt a bit uncomfortable carrying the camera, so I decided to leave all the stuff that I usually carry inside my pocket at our room. It was a very good decision. The railings of the utility boat was used as a support for the kayaks. It seems like all the lodging boats borrow from a common pool of kayaks. Mogit and Nandy on a kayak. Nandy was wearing a life-jacket because he did not know how to swim. I kayaked quite far away and harboured the kayak beside an empty floating house. I wanted to get on the pier of the floating house but did not have enough balance to do so. I jumped into water thinking that it would be easy to get into the kayak. It was not so easy. The naive method I used caused the kayak to flip upside down. I somehow managed to topple it back but the kayak was filled with water. Now I had two seemingly herculean tasks. The first was to get inside and the second was to scoop the water out of the kayak. 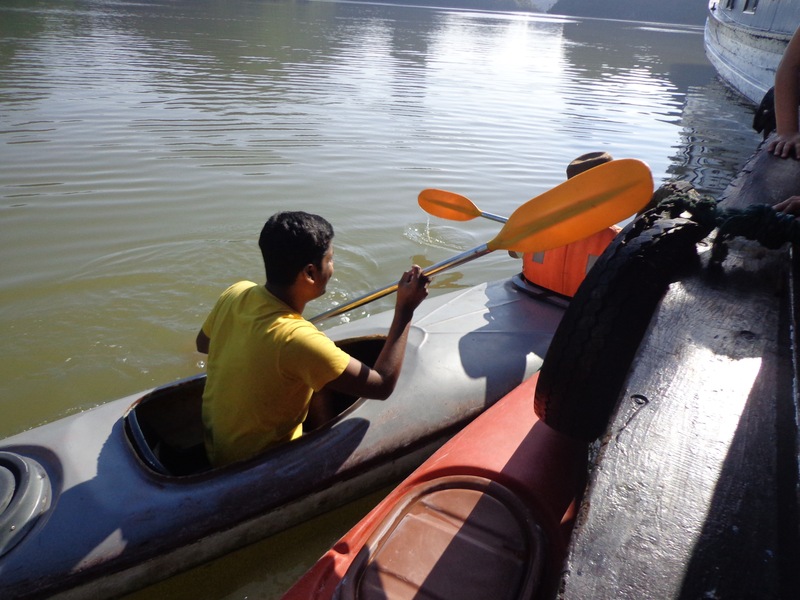 I pushed the kayak against the floating house and with the help of Mogit, managed to secure the rope against the pier. Now I had to find a way to get on the floating pier. The styrofoam floaters were covered in barnacles, which made normal climbing very very difficult. Mogit found a knotted rope. I was sure that this was the means by which locals got on the pier from the water. There were a few discarded, rusted, steel utensils. I picked up a pot and Mogit picked up a can with its top head cut open. We started scooping the water out of kayak. It was a fifteen minutes long process. It actually gave me a harder workout than rowing the kayak itself. The trick is to jump onto it from the back if you are not that heavy. Thus, your weight will be passing through the metacentre of the kayak and will prevent it from flipping over. A French co-passenger even showed me this technique first hand. I wish I had known before. There is a bit harder and faster way, too. It requires some bit of upper body strength. One must hold two ends of the lips of kayak hole and push it down, thus exerting equal force on either side of the symmetry line. Since the rider would be on one side of the kayak, they must quickly lift the lower body up and twist the hips to get into the hole. Experienced kayakers do it this way. 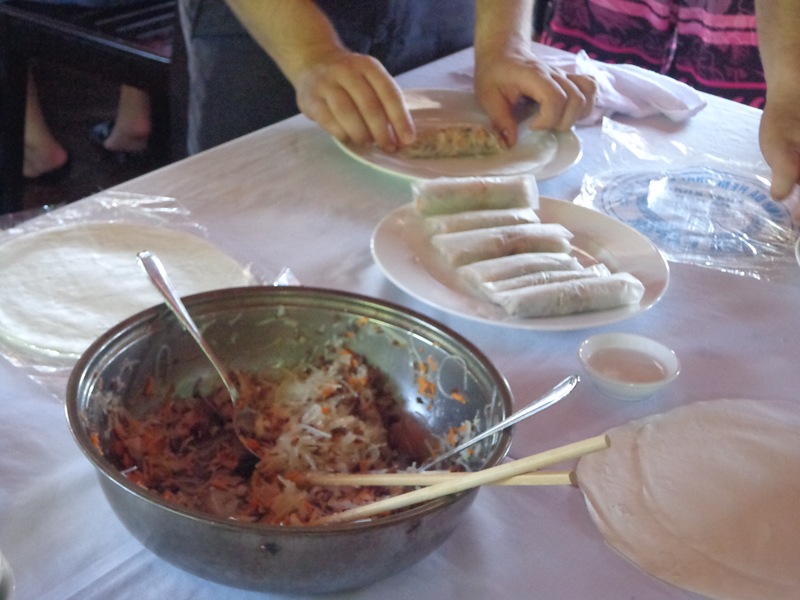 Phuong showed us how to make Vietnamese spring rolls. It’s dead easy but requires quite a bit of preparation. 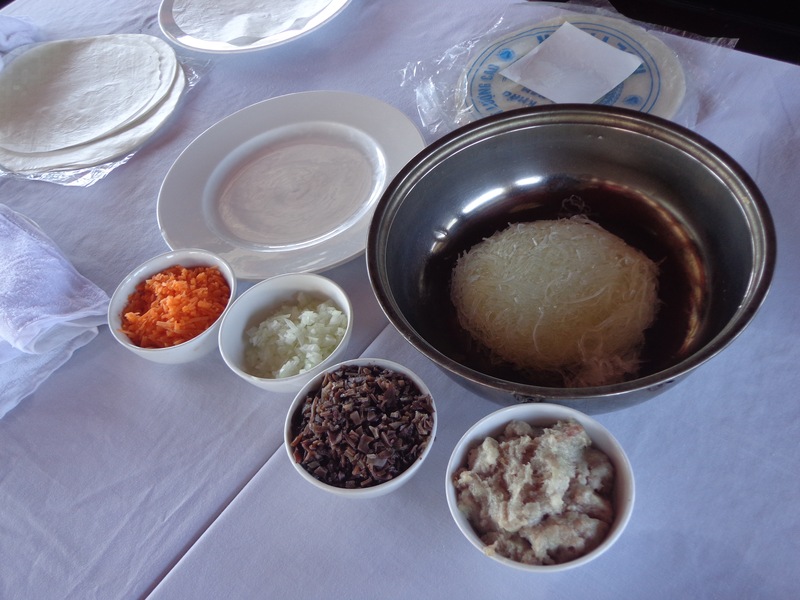 The wrap is rice paper and the fill is made up of cooked pork (specifically, bum or cheek), mushrooms (without stem, soaked in warm water), glass noodles, carrot and onion. The ingredients to make spring roll. 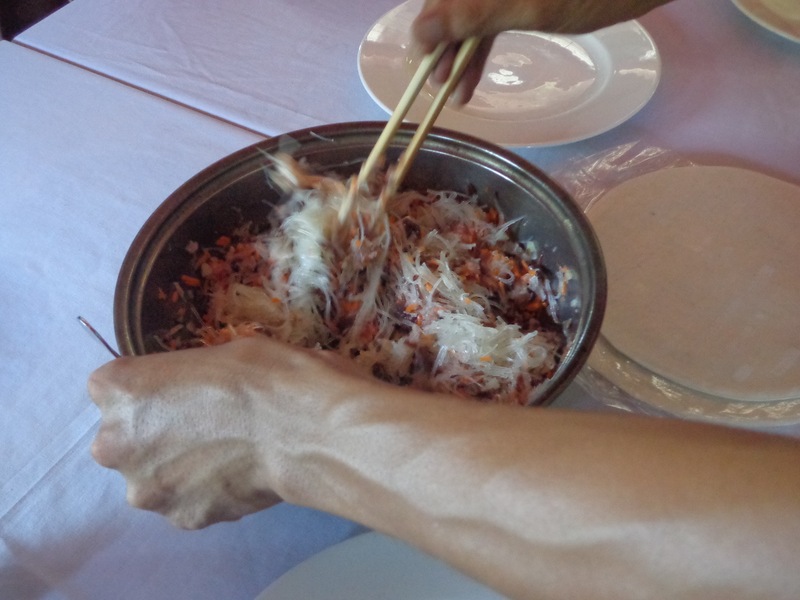 Rice paper on the plate, glass noodles in the steel bowl, carrots, onions, mushroom and cooked pork in smaller bowls. Puong explaining the process to everyone. One must mix these ingredients and on a rice paper put a bit of the mixture. The trick is to push the mixture to one side and stuff it well. 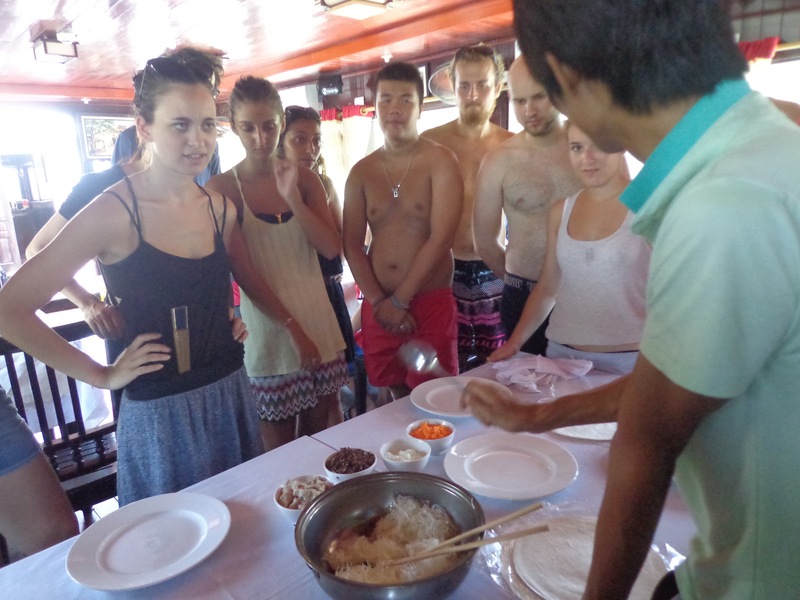 After that, the rice paper is rolled taught and the end is sealed using some water. Wrap them all up to make the rolls. These are then deep fried. The ones they served later were of uniform size made by the cooks. We were split in smaller groups and asked to board various minivans that took us back to Ha Noi. If there is something that I disliked about the Ha Long bay experience, it would be the food. It was way too westernised for my taste. A fish preparation came in as a saving grace during our day 2 lunch. 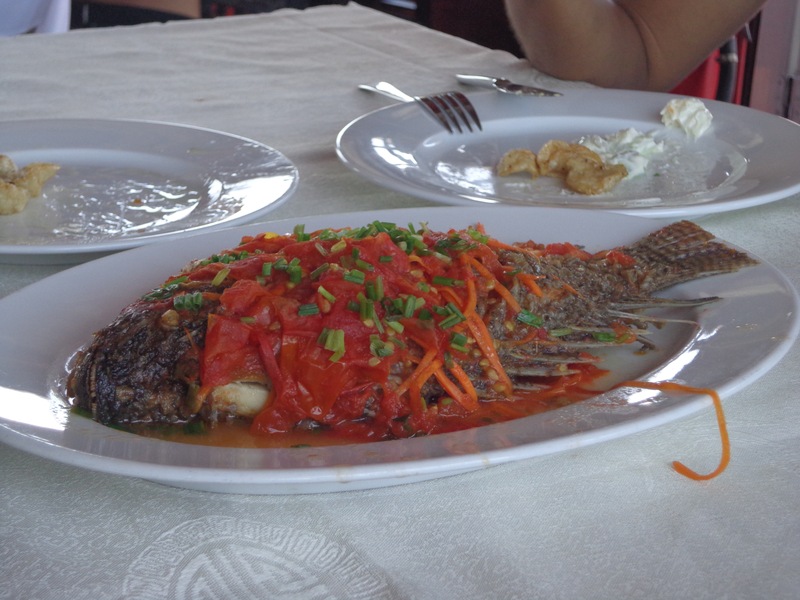 This fish dish was the closest to Vietnamese cuisine we got on the boat. In the background, on one of the plates, some western style fruit salad in mayo and some deep fried meat can be seen. On our way back, I snapped a lot of photographs from our moving minivan. It was like driving on the highway between Howrah and Kharagpur. Even the weather made extra attempt at making me feel nostalgic and uncomfortable simultaneously. A village with a factory. The factory is surrounded by rice fields. 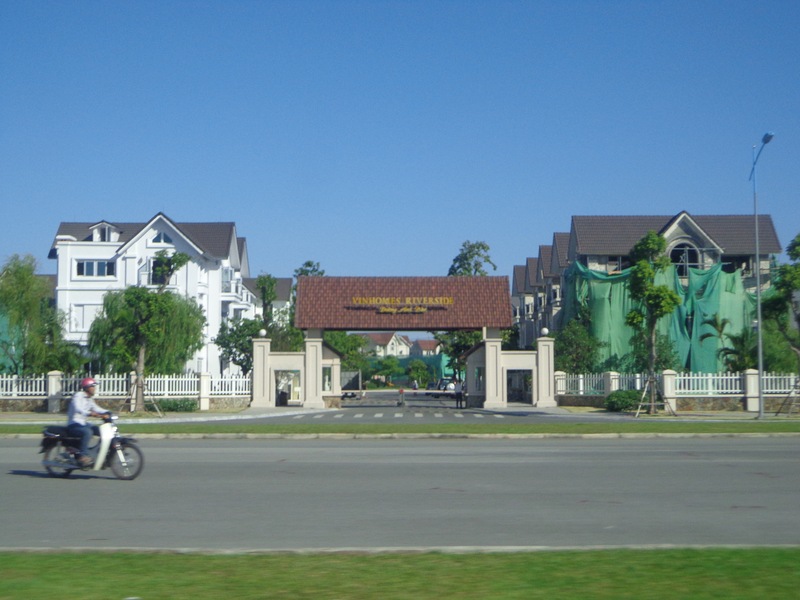 A township beside the highway. 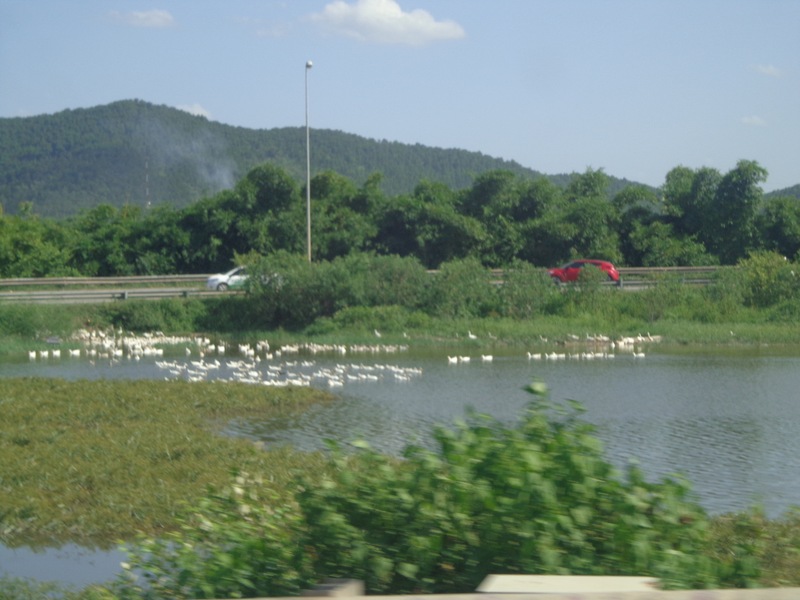 A gander of geese flock the waters in the countryside. Projects like these reminded me of the real estate projects undertaken near the outskirts of Bangalore. This is a cantilever truss bridge. 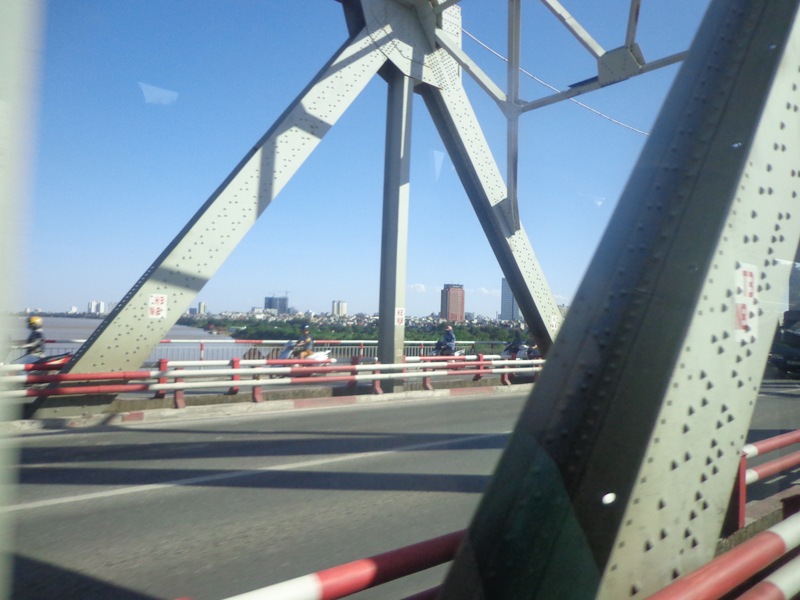 A railway bridge and a suspension bridge was also visible on the same river. If you have been in West Bengal during the CPI(M) era, it wasn’t so uncommon to see the hammer and the sickle sign – a universal communist symbol for the hardworking man. In many government buildings, a red flag bearing this symbol can be found. Sadly, the minivan was moving too fast for me to take a snap. 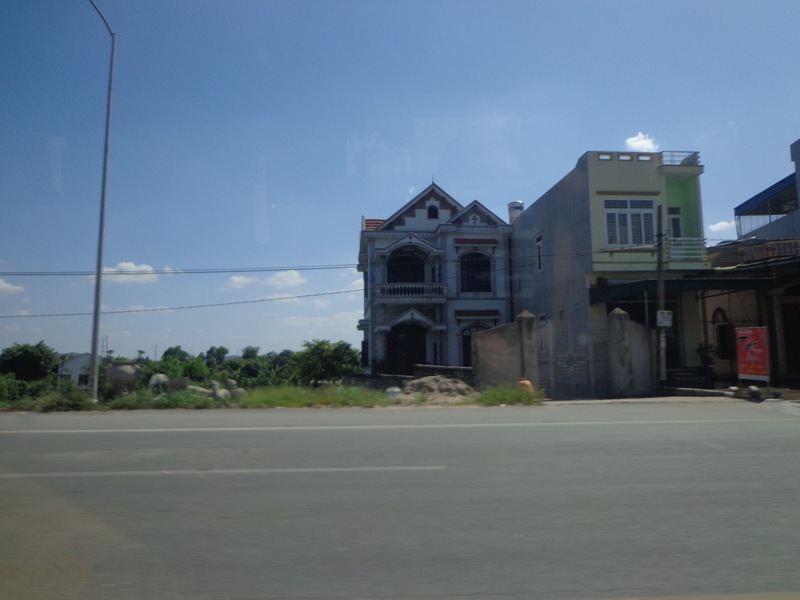 By the time we reached Ha Noi, we were starving. However, we opted for some absolute street food. So far, we had food from places that at least had a shop that served as a kitchen. This particular place had the kitchen on the street itself. We had a beef roast (self barbecue like day 2), a beef omelette and a rice-beef preparation. The kitchen, chef, waiter and dining space – all on the street. This is truly street food. 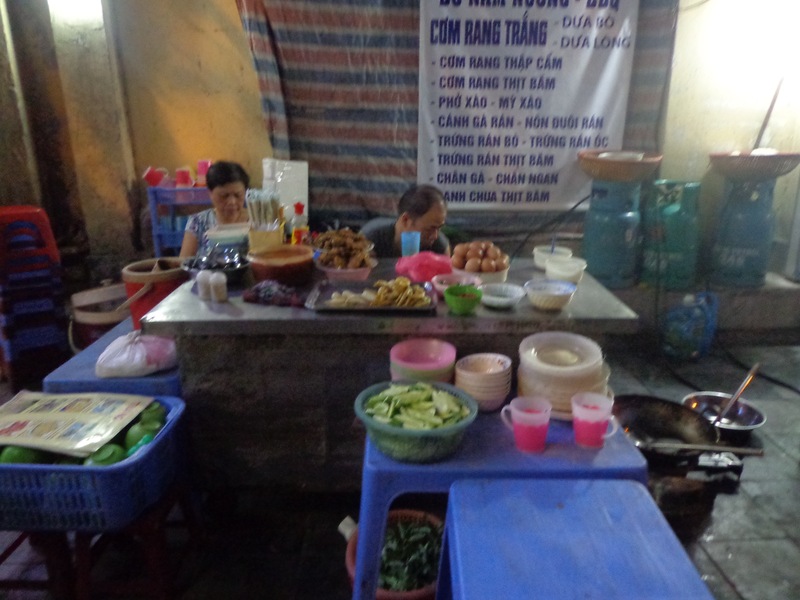 In short, if you are in Ha Noi and would want to sample the local cuisine, Old Quarter is the neighbourhood to be. More specifically, Ma May street is the street to be. Vietnamese massage is not as famous as Thai massage. It is not as intense and lacks the perception of sexual connotation usually associated with its Thai counterpart. For 300k VND we each got a full 60 mins of massage. Although the place looked shady and the masseurs did not know English, we managed. The language barrier was so huge that the weird conversation between Mogit and one of the ladies caused quite a bit of amusement to two South African customers in the shop who were having their feet massaged. 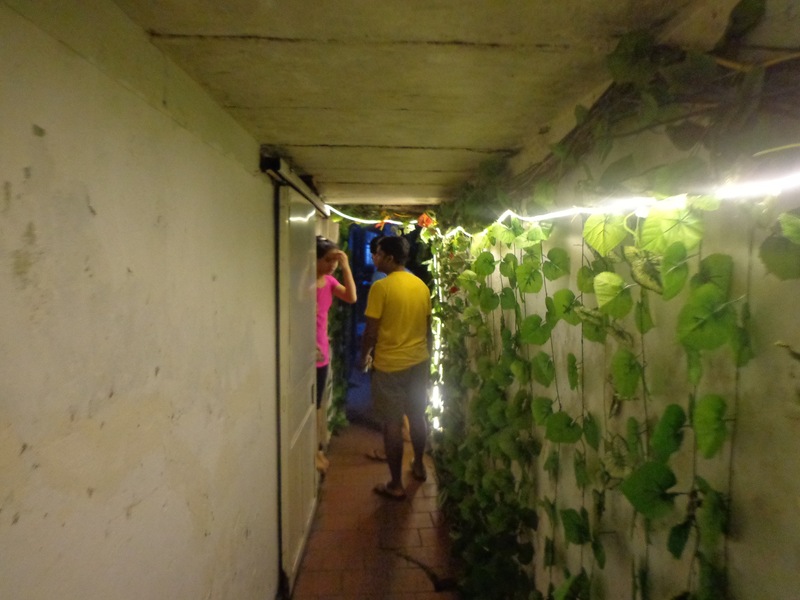 The massage parlour was inside a small lane. It looked shady but it wasn’t. 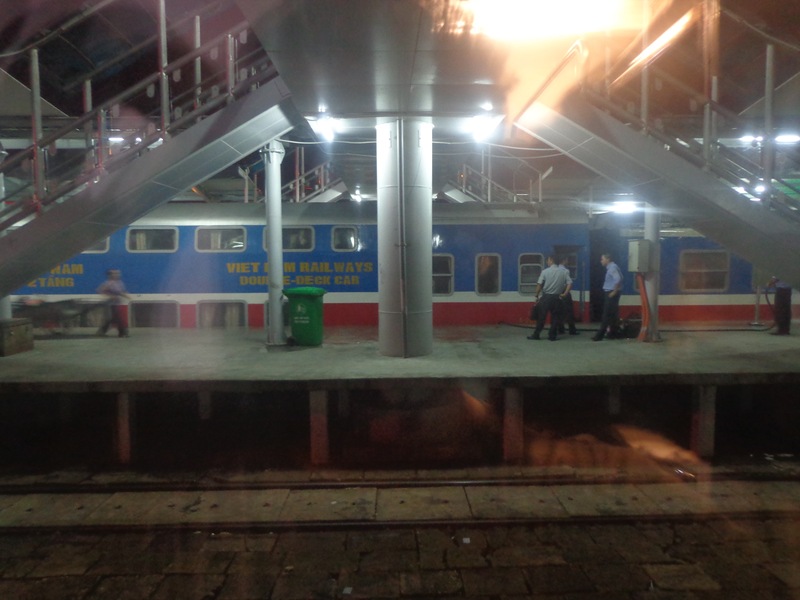 Prior to leaving for Ha Long bay, we had asked our hotel to arrange for two reservations at the 10.00 pm train (SE3) to Hue. 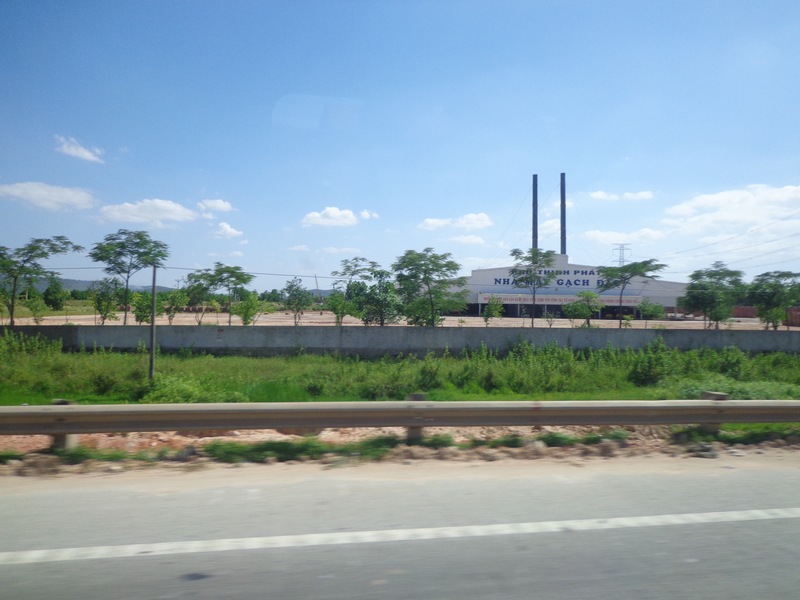 Train SE3 runs from Ha Noi in north Vietnam to Ho Chin Minh City in south Vietnam. Hue is somewhere in between. We paid about 55 USD per person. When we enquired from the other foreign tourists, they said that we got a very good deal. I am still sure that Vietnamese people pay much less. We bid goodbye to our host Du and and our friend Mogit (he would fly back to Singapore tomorrow) and walked our way to the Ha Noi railway station. The station looked like a mid sized terminal in India including the infrastructure like platforms and overbridges. However, the interior of the train was far better than what we are used to back home. 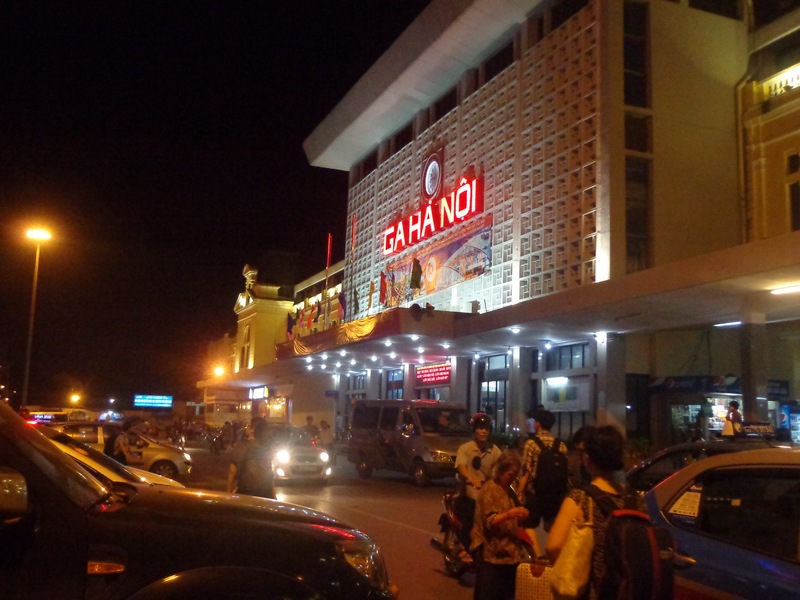 This is Ha Noi railway station. I realised that this was the point where our minivan from the airport had dropped us on our first day. 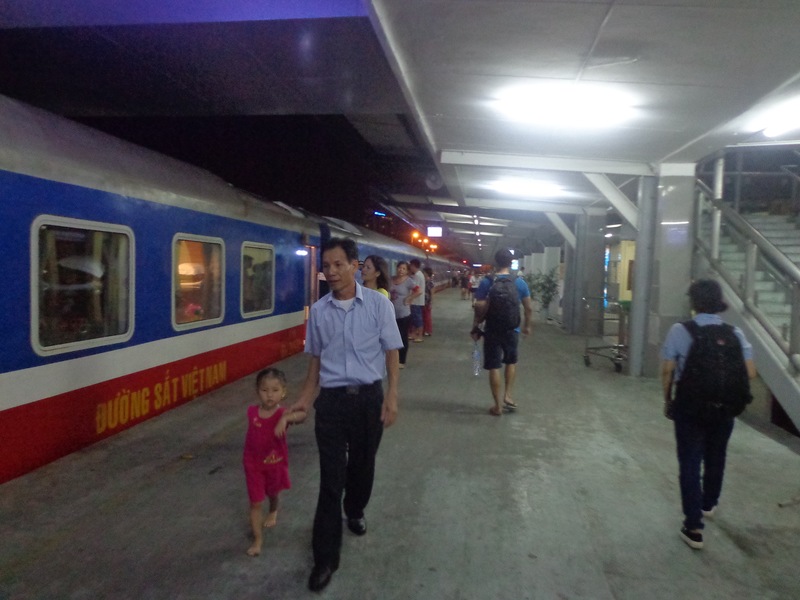 Ha Noi station, platform 1. The SE3 is waiting for departure. Overbridge connecting platform 2 and 3. I could easily pass this as a picture from some Indian railway station. 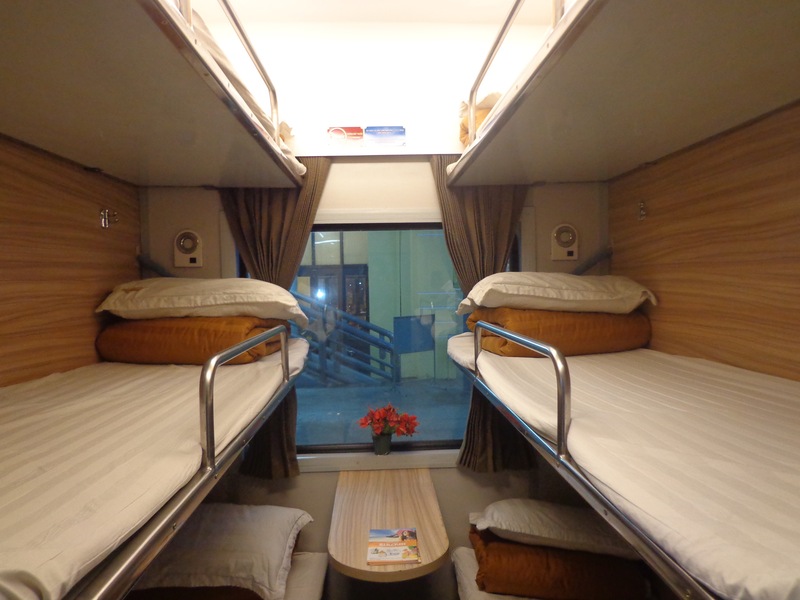 This is the second class sleeper with 6 beds per cabin. The interior and the facilities is better than our Indian counterpart. It is necessary to keep wallet and passport with oneself at all the times. Optionally, a mobile comes handy. If you are a traveller like me, you would want to keep your pocket camera in your pocket. Rice paper becomes sticky and disintegrates in water, much like cigarette paper. If the rice paper is thick and hard, it must be lightly moistened before making the rolls.